Who doesn’t love products made by their home country? It is the 5th birthday of Whistler Naturals Skin Care Inc‘s and it’s my first time hearing and trying it! 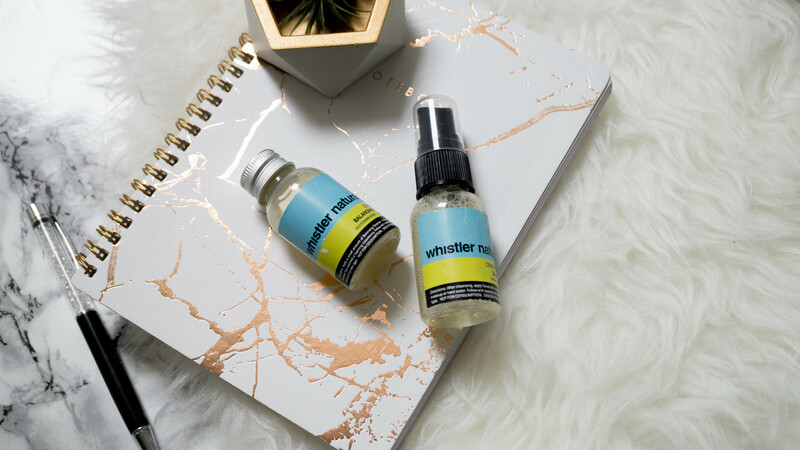 Lisa McGregor, founding partner and CEO of Whistler Naturals Skin Care Inc, reached out to me and gave me a brief explanation on their products. They contain bio-active botanicals, essential oils, floral waters, butters, and real fruits and veggies. I’ve always avoided eating carrots since I was a youngster who knew nothing, but I would definitely put some on my skin if you told me I can still have radiant skin in like 20 years or so. 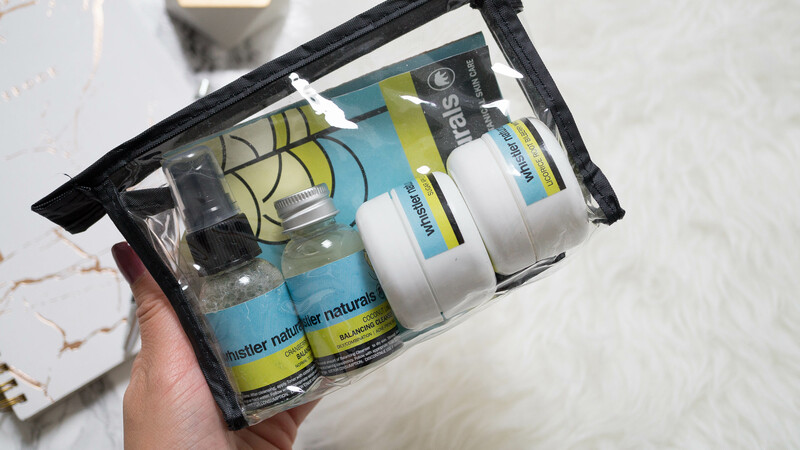 Sample sets are one of the best ways to try a skincare line and the Clearly Natural “Organic Spa” Starter Kit was a great choice given how up and down my skin is lately. I could have nice skin for a week, then explode with a breakout on my forehead and neck a week after. 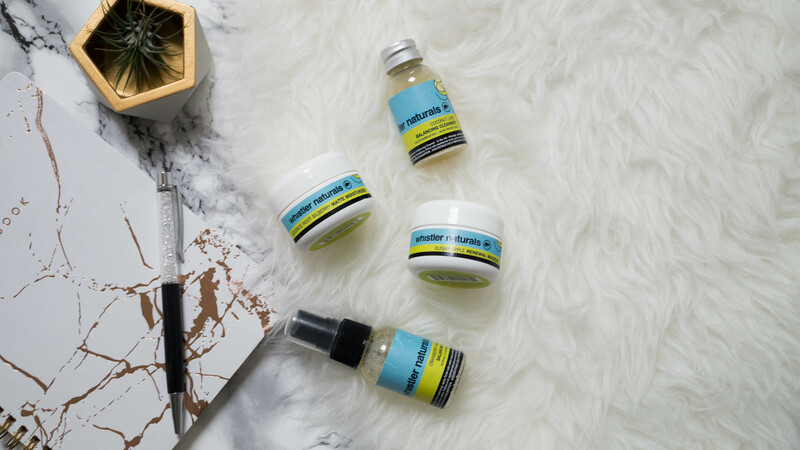 This set targets oily/combination and acne prone skin (me me me me me!) It comes a Cranberry Mandarin Balancing Toner, Coconut Lime Balancing Cleanser, Licorice Root Bilberry Matte Moisturizer, and Sugar Apple Renewal Masque. These sizes are airplane perfect and I definitely will be reusing the toner and cleanser bottle! The Cranberry Mandarin Toner ($19.98 for full size of 120mL.) is my favourite in the set. It has a tarte and sweet scent and my skin feels hydrated before I put on any moisturizer. 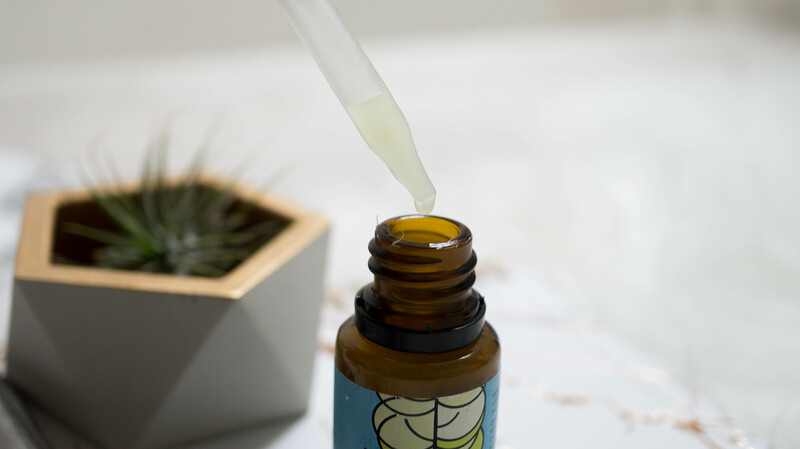 You can find the list of ingredients online here, such as cranberry extract, cucumber fruit extract, carrot root extract, rose flower oil, orange oil, and jasmine essential oil. There’s so much veggie goodness in here, I wish my body absorbed that as my daily servings, rather than me actually eating vegetables itself. The cleanser to go with the balancing toner above is the Coconut Lime Balancing Cleanser ($23.98 for full size of 120mL.) It has a refreshing fragrance that kind of reminds me of a mojito. It is a gel based cleanser and doesn’t strip your skin of its natural oils. It contains Certified Organic extracts such as Witch Hazel, Green Tea, Calendula, combined with Lime, Basil, Arnica, and White Willow. It doesn’t have a thick lather, but it rinses off my makeup very quickly and my face didn’t feel tight with dryness afterwards. After cleansing the skin, you apply a layer over the face and leave it for 15-20 minutes. It does a have a tingling sensation (so you know it’s working!) though I didn’t feel the warming sensation apart from putting it on my skin in the beginning. After cleansing, my skin looks noticeably brighter. 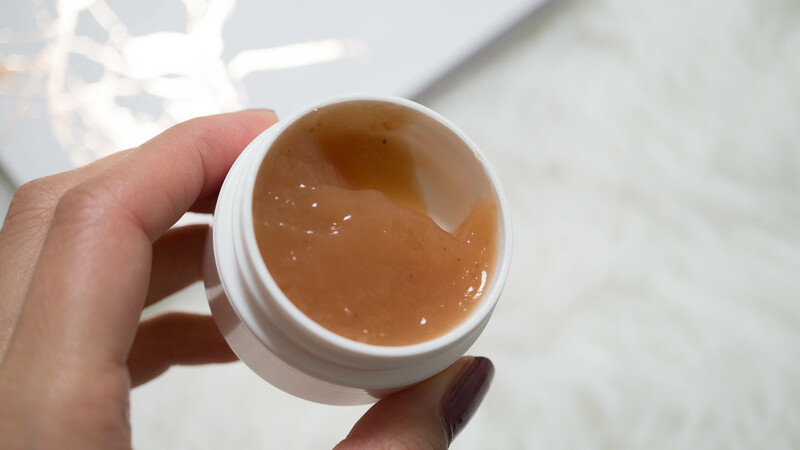 I’d say the results are comparable to the Fresh Rose Face Mask – but much more affordable! The Licorice Root Bilberry Matte Moisturizer ($29.98 for 30mL) is a soothing cream that contains botanical extracts of Bilberry Leaf, Organic Clendula, Organic Chamomile and Lemon, Organic Aloe Barbadensis Leaf and Carrot Root Extracts. It does a have bit of a kick in the scent, probably from the licorice. I prefer using this at night after destroying a pimple or two. I haven’t noticed any major difference in my skin. 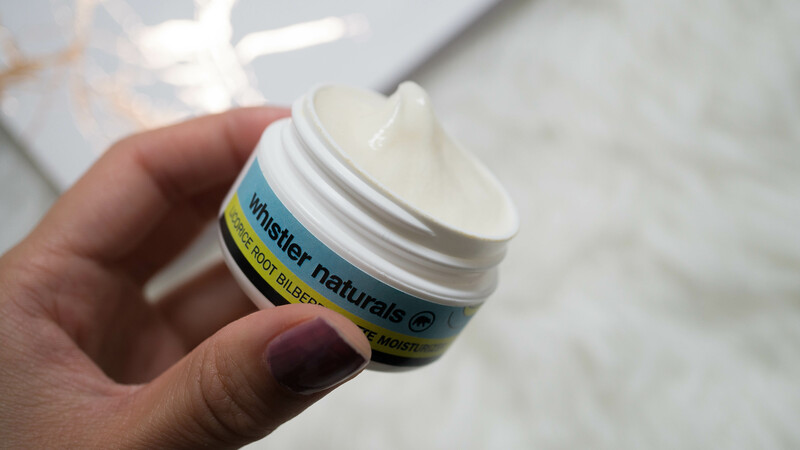 There’s many amazing moisturizers in the market and I’ve tried many great ones that all work fine to me though the ingredients of the Licorice Root Bilberry Matte Moisturizer stands out. One neat thing – I got a burn on my finger from the carpet car seat (major fail I know,) so I put some of this moisturizer on and it felt a LOT better; compared to hand creams I was using earlier. There is also a small sample pack of the Green Apple Stem Cell Illuminating Serum ($35.98) in the Clearly Natural “Organic Spa” Starter Kit but I also got a full size to try out as well. It is a gel serum targeted for skin that tends to have breakouts or acne. It contains Azelaic Acid, one of the main ingredients in prescriptions for topical acne. I find this works best on breakouts that are drying up. I had a few zits that are under my skin and I applied the serum, and they all came out at once. Not sure if the serum helped get rid of my pimples quickly, but after I clay mask the absolute crap out of it until my skin is dry- that’s when the serum works for me. 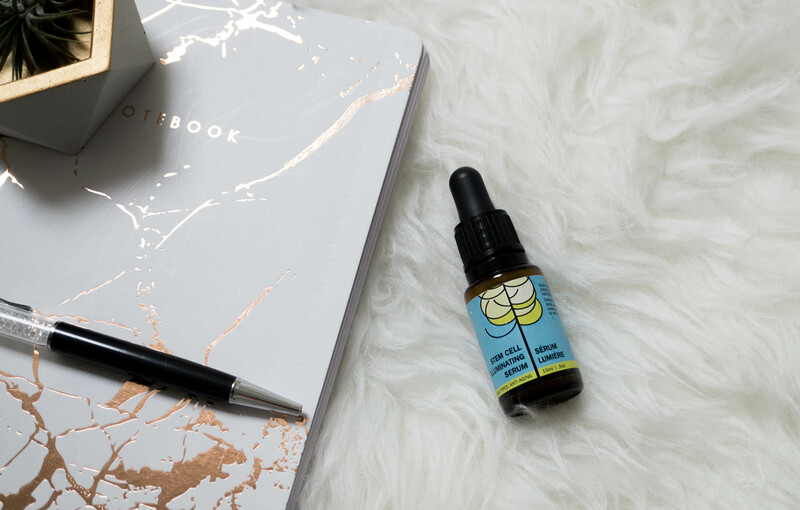 I’ve been applying it around my neck/chin to fade acne scars, and I swear they’re become more faint – I will keep observing this! The scent is great, especially if you like taking in the fragrance of freshly picked green apples. The website may seem overwhelming with ingredients and many products, but there are lot of options for many skin types. If I were to repurchase the products ( I rarely repurchase things nowadays as I’m lucky to try so many different products,) I’d go for the cleanser and toner. They smell good and leaves my skin feeling instantly better. I need to use the serum longer to see how it interacts with my acne and the moisturizer works better as a “once in a while” cream for me rather that something daily. Contest ends September 27th at 11:59pm. Enter through the Rafflecoptor widget below.